Lewiston nuclear waste to be removed. Now what? 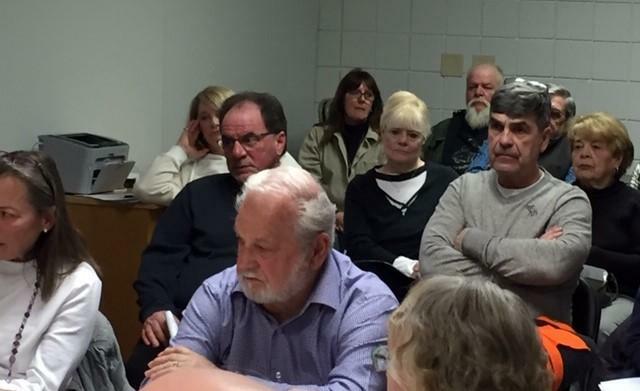 Two things emerged from a thinly attended public meeting in Lewiston Tuesday night: Washington will remove the nuclear waste from the Niagara Falls Storage Site in the town, but no one knows when that will be. The bureaucratic process of planning for what to do about stored nuclear waste in Lewiston lurched forward Tuesday when the U.S. Army Corps of Engineers said a final decision has been made: the material will be dug up from an underground vault and hauled away. Making that choice from four possibilities has been on Washington desks for years. The announcement was made just hours before a public meeting Tuesday night at the Lew-Port Community Resource Center. This heavily radioactive waste is left over from the first atom bomb program in World War II. Washington decided the waste should be removed from a 10-acre concrete tomb and taken somewhere. "It's in the Corps' mission right now," said Local Special Projects Branch Chief Bill Kowalewski. "We're executing the projects and you're right: when we're done with a cleanup, we finish the cleanup. We operate and maintain it for two years to make sure it's operating as we designed and then we do hand it back to the Department of Energy - and they, they, then have the mission to monitor the site in perpetuity." The problem is that Lewiston removal will cost at least $500 million, according to a 2015 estimate, but the entire federal budget for these 23 FUSRAP (Formerly Utilized Sites Remedial Action Program) sites nationally is only around $120 million. Another problem is that Lewiston is 13th on the list of 23 of these sites, according to Kowalewski. "When are you going to start it? Which they don't talk about and you heard it in there. They don't have any idea when they're going be start. They're just going to go through this process," Burmaster said. "And if you are talking about $115 million a year or something that's set aside for all those different landfills: When are we ever going to get up higher than 13 on the list? We never will. We'll never make it up there." Amy Witryol told the meeting there are a lot of issues. "The utilities, the water, the electricity and then we can begin thinking about what we want that property to be for the next generation," Witryol said, "because the Department of Energy, given the proposed plan for complete removal, is not going to want to spend the amount of money on a site this small and be a caretaker for perpetuity." It has been more than 70 years since the end of World War II, but that does not mean debris of the war's industrial production has gone away. Federal regulators are moving ahead with plans to ship nuclear waste from Canada across the Peace Bridge, drawing outrage from Congressman Brian Higgins.